My family and I adopted Hunter from a woman who bred dogs. She advised she did not have enough time for the dog. She had done some basic training with him. He was well socialized to other dogs but not so much to people. 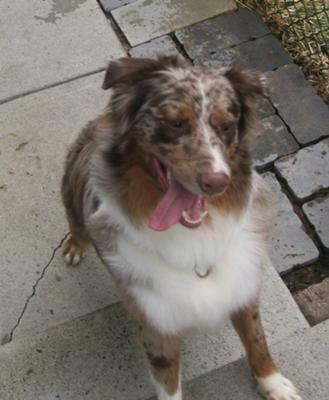 He is a beautiful red merle and had a good pedigree so I paid $600 for him. Apparently she had tried to show him but was advised his ears were not acceptable. I did not care about his ears. We have five acres and deer eating our shrubs and getting into our vegetable garden and orchard so I thought a working type dog might work for us. After we brought him home he would be wary and nervous in the mornings growling at my husband and son when they came downstairs in the morning. He would occasionally snap at them. He seemed to attach himself to me. I think because his other owner was a woman. Anyway his strange behavior went on for a good month. We were worried that he was too neurotic. Anyway he began to get better when one day my son had a friend over. This friend was running in the backyard with my son when Hunter jumped up with his mouth open and scratched the boy on his cheek drawing a little blood. My husband and I were besides ourselves. This boys parents were not too concerned but we were afraid of the liability involved in trying to rehab this dog. We tried to give the dog back free of charge, however the woman did not come to pick him up as agreed. We were cursing ourselves for not getting another Lab. Our past Lab had been so passive and easy. This dog is high energy. I began reading about Aussies and was horrified to learn that they don't calm down until they reach 7 yrs of age. Then I saw the video of Rockin Rory on You Tube and realized these dogs are way smart and need mental stimulation. Well long story short after neutering him to take the edge off and working with him daily he has come around to be a great dog. He goes to doggy day care a couple times per week and runs with his pals. This seems to satisfy some basic need. Now when he is home he is less driven. I regret having to neuter him but it really did help. I think we will do some agility training soon. His personality is more intense than a Lab's but also more interesting. He likes to sit with his back to me on the couch and then falls backward into my arms like a baby to cuddle. He looks so sweet. I'm glad oyu got him away from that lady who didn't really care about him. You're doing the right thing, you will be rewarded, by him someday.